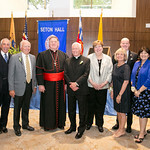 On June 20, Seton Hall University dedicated its newest campus building, Bethany Hall, as a tribute to Monsignor Robert Sheeran '67, in recognition of his 30 years of priestly service to the University, including 15 years as president. Monsignor Sheeran requested that the new welcome center be named Bethany Hall, after the Biblical village where Mary, Martha and their brother Lazarus received Jesus into their home, as a place of friendship and community. 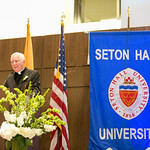 "I see this name as an acknowledgement of much that Seton Hall represents. For Jesus, Bethany was a place of welcome and hospitality that embodies our mission at Seton Hall as 'a home for the mind, the heart and the spirit,'" said Monsignor Sheeran. "Bethany Hall will serve as an outstanding venue of welcome and engagement for both visitors and students, offering multipurpose space and meeting rooms for campus events." 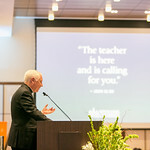 More than 100 donors contributed $7 million, including a lead gift of $3.5 million from Board of Regents member James O'Brien '82 and his wife, Judy, to honor Monsignor Sheeran. O'Brien, Senior Managing Partner at Napier Park Global Capital, appreciates the parallels. "My family and I have been fortunate for many years to first have engaged with the warmth and caring of Monsignor Sheeran ministering to us as a priest and pastor, then experiencing his vision and leadership as a University president. 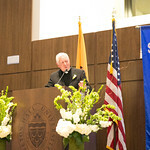 His life's actions for us and many families at Seton Hall are resonant with the lessons of Bethany," O'Brien explained. 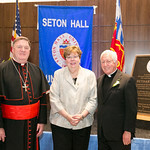 As a transformative addition to the Seton Hall campus, it is fitting and appropriate that the building honor Monsignor Sheeran whose history of leadership at the University is equally transformative. Bethany Hall will serve as a welcoming multipurpose space for both visitors and the University community, offering event space and meeting rooms for students and alumni as well as serving as the central location for admissions activities. From left, Monsignor Sheeran congratulated by Cardinal Joseph W. Tobin. 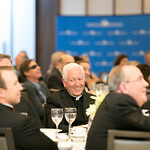 Monsignor Sheeran has made a singular and historic impact on the life and progress of Seton Hall University. His 55-year relationship with the Pirate community — including his 30 years of priestly service – has enriched countless lives. His Seton Hall story began when he enrolled in the University as a freshman in 1963. Graduating four years later with a bachelor's degree in classical languages, he went on to study in Rome and was ordained in 1970, receiving a licentiate degree in theology from Pontifical Gregorian University in 1971. He received his doctoral degree in sacred theology from the Pontifical University of St. Thomas Aquinas (the Angelicum) in 1979. 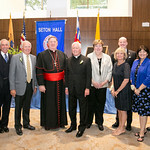 Returning to Seton Hall in 1980, Monsignor Sheeran spent the next 15 years serving in a number of positions including as rector of Saint Andrew's College Seminary, assistant provost, associate provost, and then, executive vice chancellor before his investiture as president in 1995. His presidency would last for 15 years, the second longest tenure in University history. 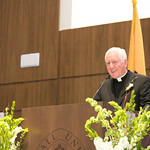 Marked by his creative vision, Monsignor Sheeran led Seton Hall's transformation from a respectable regional Catholic university to an eminent institution of Catholic higher education with a national and international scope and reach. 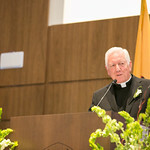 Dynamic hallmarks of Monsignor Sheeran's tenure included overseeing the creation and establishment of the School of Diplomacy and International Relations, a major campus makeover including the addition of Jubilee Hall and the Science and Technology Center and instituting an award-winning mobile computing program hailed as one of the most innovative in the nation. 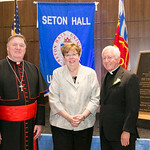 "Bethany Hall represents all the best about Seton Hall in so many ways," shared Interim President Mary J. Meehan '72/M.A. '74/Ph.D. '01, who has known Monsignor Sheeran for over 30 years. 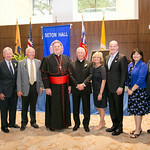 "The building itself will be the first point of entry for future Pirates, welcoming young people just beginning their lifelong relations with Seton Hall. We gratefully acknowledge the generosity of our donors, alumni and friends like Jim and Judy who demonstrate the impact our graduates continue to have long after graduation. 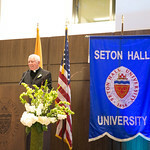 And, of course, dedicating the building to Monsignor Sheeran, who has devoted his life in service to God, to others and to Seton Hall, speaks volumes about the tremendous gratitude we all hold for him."